Email users often ask with a hint of panic "Why did my email contacts disappear after my Outlook upgrade? I used to start typing Joe’s name and presto, his address appeared, and badda-bing badda-boom it was selected. Now, nadda." A check of users’ computer contacts list may — but usually does not — include the errant email address. What’s going on? As it happens, to provide quick and easy searches your email app (Outlook, Apple Mail, Gmail, etc.) stores in an internal "index" a copy of each email address in messages sent and received. As we begin to enter an address to a new message the email app first begins searching the computer’s contacts list for matches. Failing to find a match in the contacts list, the app may then search its index of previous messages. If the address is there, with nary a care users simply select the address from the index. Life is good. No nadda ain’t badda, right? Maybe. An index of prior email messages isn’t a reliable contact manager. 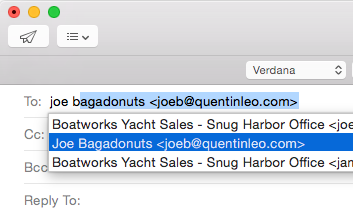 If and when Joe’s email address changes the email app’s index will display only his old address until a message from the new address is received. Moreover, if all messages to or from Joe are deleted, the email app’s index will no longer display his name or email address at all. Similarly, when our panicked user's email app was upgraded its index of previous addresses (not the messages themselves) was deleted along with the old app version. Badda-bummer. "What do I do with this techno-tip", you ask? Don’t rely on the index of prior recipients in email apps like Outlook or Apple Mail to maintain your contacts list for you. Add new contacts to your computer’s contact list where they will be secure, accurate and accessible. Care for your contacts. Update contact information when you're aware of a change. Make the effort to use correct capitalization and spelling. Recipients of your messages will appreciate it. You’ll look good too.